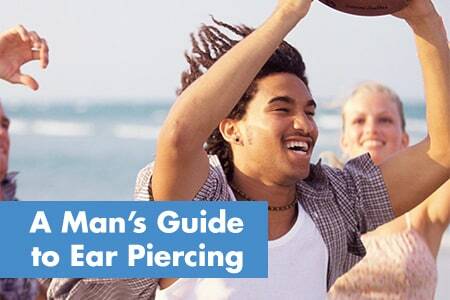 Over the past few years, the popularity of ear piercing for men has increased significantly. It is believed that men have worn earrings for as long as civilization has existed. Jade earrings for men dating back to 3000 BC have been found in Southeast Asia. In ancient times, men wore earrings in places like Assyria and Babylonia to denote their rank in society. Aztec warriors wore them as a mark of honor. Primitive man, as far back as 10,000 B.C, pierced himself to wear earrings which were not only adornments that spoke of power, but also prized possessions. Yes, it might hurt a little, but just for a minute. Some people report feeling a pinch. Others say it stings a little, and others say they barely feel it all. Every ear is different. But hey, if a 7 year old girl can do it, you can too. Do they make XL earrings for guys? Piercing earrings come with standard size posts in lots of styles and metal choices that should work just fine for you. If you have extra thick earlobes, ask for a style with long posts. Your piercer will be able to help you select the style and size that’s right for you. What’s the best metal for me? Piercing earrings are available in a variety of hypoallergenic metal choices: 14KT Gold, 24KT Gold Plate, Medical Grade Stainless Steel, and Medical Grade Titanium. If you don’t have a history of metal allergies, you can choose whatever style fits your look and budget. But, if you have a known nickel allergy or have ever had a reaction to jewelry, your safest bet is titanium since all metals – except titanium – have a minute amount of nickel alloy for strength. Where’s the best place to have my ears pierced? We recommend choosing a location that has a good selection of sterile, hypoallergenic piercing earrings and a well-trained staff using a safe ear piercing system like Inverness. The average earlobe piercing takes 6 weeks to heal. For safe healing, be sure to follow the aftercare instructions you will be given when you have your ears pierced. For more information on taking care of newly pierced ears, click here. If you have any other questions, contact us here. Good luck.